It&apos;s nice to see the largest newspaper west of the Mississippi delving into the breaking news concerning the alternative sexuality of a fictional character. While the hills were alive with fire, while the nation is at war over lies, the Times wielded its muscle to contact Andrew Slack of the Harry Potter Alliance who helped them read the writing on the wall regarding the fantasy wizard dude and who he liked to hold hands with in movies. 1. His pet. "Fawkes, the many-colored phoenix, is &apos;flaming.&apos;"
2. His name. "While the anagram to &apos;Tom Marvolo Riddle&apos; is &apos;I am Lord Voldemort,&apos; as my good friend pointed out, &apos;Albus Dumbledore&apos; becomes &apos;Male bods rule, bud!&apos;"
3. His fashion sense. 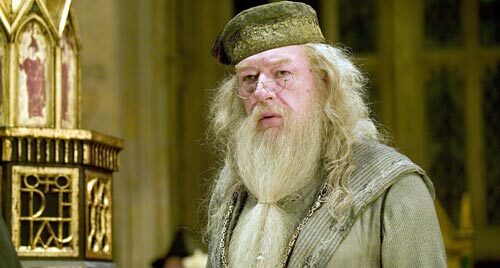 "Whether it&apos;s his &apos;purple cloak and high-heeled boots,&apos; a &apos;flamboyantly cut suit of plum velvet,&apos; a flowered bonnet at Christmas or his fascination with knitting patterns, Dumbledore defies the fashion standards of normative masculinity and, of course, this gives him a flair like no other. It&apos;s no wonder that even the uppity portrait of former headmaster Phineas Nigellus announced, &apos;You cannot deny he&apos;s got style.&apos;"
Anagrams to prove people are gay? What&apos;s next tossing them in tub champaign and seeing if they float? Well, thanks Times for this investigative reporting. For the rest of their 7 signs, read the whole piece here.